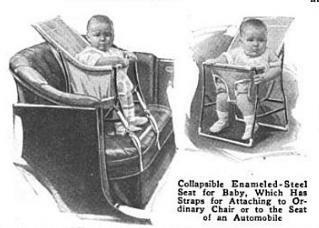 I know that I have seen at least on child car seat photo from the T period. Can someone either post on here or give some links? Here's a few shots of ours. Actually fits better in the front door because of the door opening shape. That looks kinda unsafe. Were they very popular in the day? 1. Kid flys out of the car seat, hits windshield, mother follows and crushes kid when she hits windshield. 2. Kid is held in mothers arms and is squashed against windshield when they both slam against it. If that sounds harsh, I'm the safety director at work and those are facts not my feelings. Back then the results of accidents were accepted differently than they are today so we look at things from an almost opposite perspective. 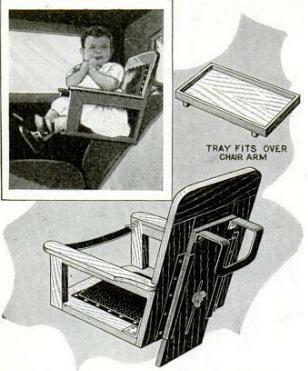 A few Child Seat patents from the 20's. 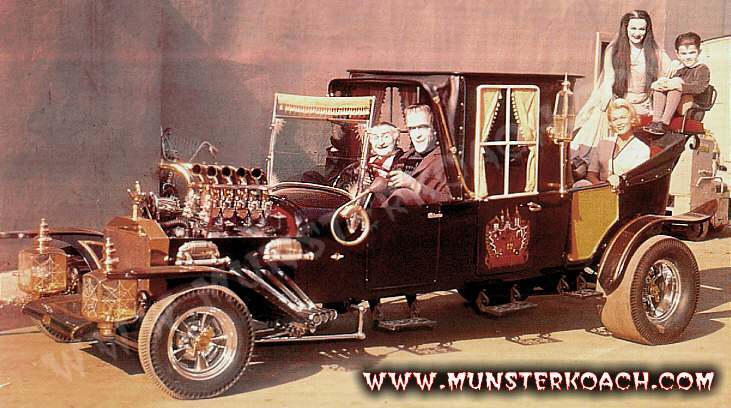 It's a Model T - if you all are that worried about the kids - take the Volvo. 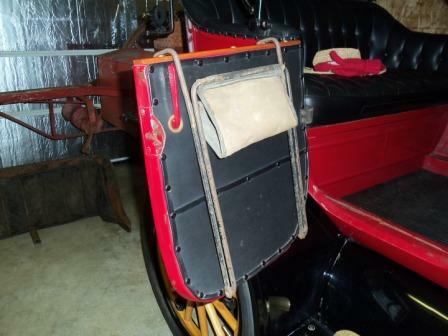 I've seen some type of crib hanging from the top bows of a Model T in an original photo, but I can't find it now.. 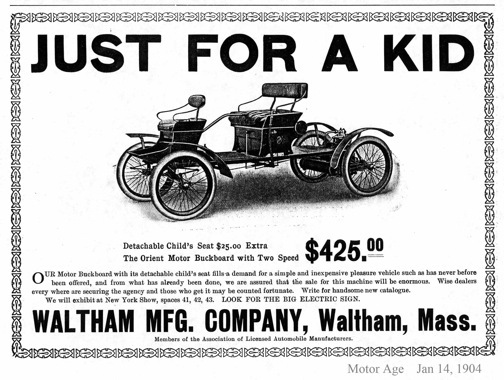 In many states, children in antique automobiles are a bit of a legal problem. I can't really say that is a bad thing. 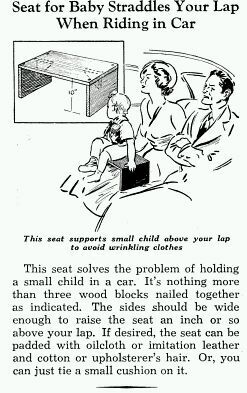 Small children really should be in modern safety seats and properly belted into the back. This statement from someone who refuses to even put seat-belts in his '24 coupe where they might help, but they ruin that authentic feeling. But in that, I risk my safety, not a child's. Even in a rollover, a good carseat could save a small child. Generally, I would no more put seat-belts in an open T than I would on a motorcycle. 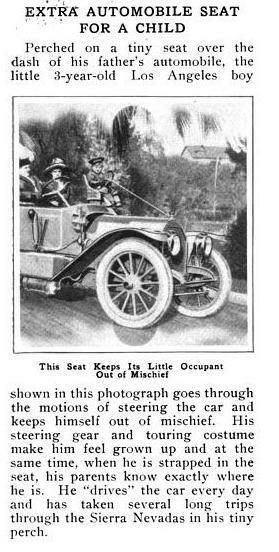 Realistically, children riding in an antique car are not in anymore danger than they are holding your hand walking down the street. 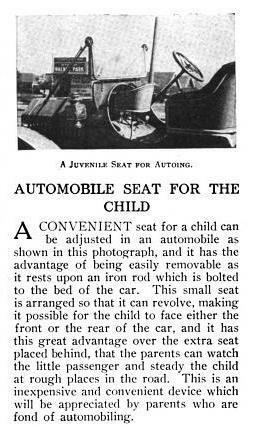 Another aside, way back in the day, it was not uncommon for a child to fall out of a moving automobile. Most often, due to low speeds and dirt roads, they were not seriously injured. With speeds and traffic these days, it is a little different. "Another aside, way back in the day, it was not uncommon for a child to fall out of a moving automobile." I saw that firsthand when I was about 4-5 years old. A toddler fell out of the back window of a sedan, apparently hitting face first on the gravel shoulder, as it had many cuts. We were walking along old Hiway 66 in Ashland, Oregon, and it happened just in front of us. My Mom said he wasn't hurt real bad, because he was crying loudly. 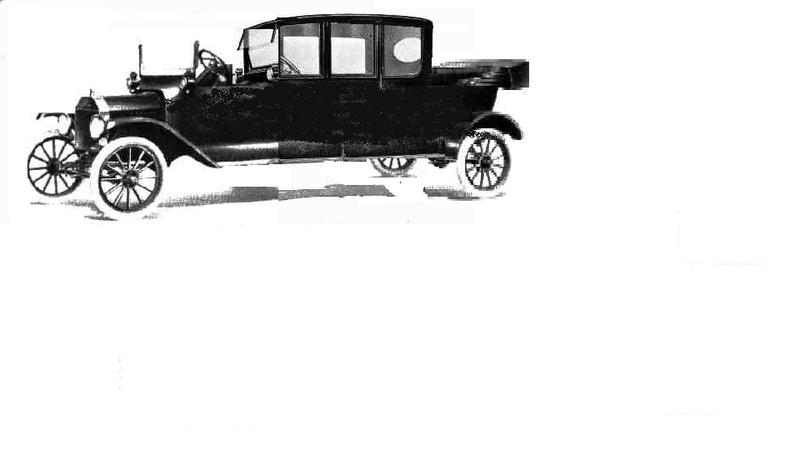 To appreciate how far we've come in personal safety, you have to read Nader's "Unsafe at Any Speed." He described a kid losing an eye on a radio knob in a Buick making a fast stop from 15 mph, truly unsafe at any speed. A GM engineer defended lack of restraints by saying he trained his kids to put their hands forward for bracing when he yelled, "Hands!" My dad fell out of my grandfather's 1919 touring when he was a boy. He dusted himself off and jumped back in. Factor in that the car was probably doing 10 mph. Another time, probably in the 20's, my grandfather got a speeding ticket for doing 12 mph in downtown Detroit. 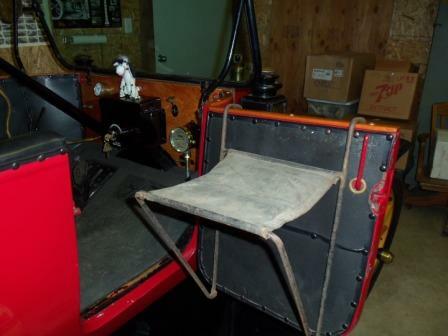 The child's seat in the family's 1926 Fordor was two little wooden chairs on the back floor. Not fastened, just sitting on the floor. They were a family of 7 at the time. Still have the car, wish I had the chairs. My comment above was not to be accusatory about the nostalgia of the old car seats or towards anyone who owns one - it was surprising to see how close the bottom of the seat was to the side of the door. All it would take is one rough bump and the kid would bounce onto the ground. Growing up on a dryland wheat farm that had been in the family since we homesteaded in 1888, there were many old pieces of equipment without safety in mind; however, that did not stop my family from not using them or modifying them. I realize it was a different era and that there were many unknowns with the advent of new technology. Common sense just doesn't apply to that type of seat in Steve's photo, from my viewpoint, at least. 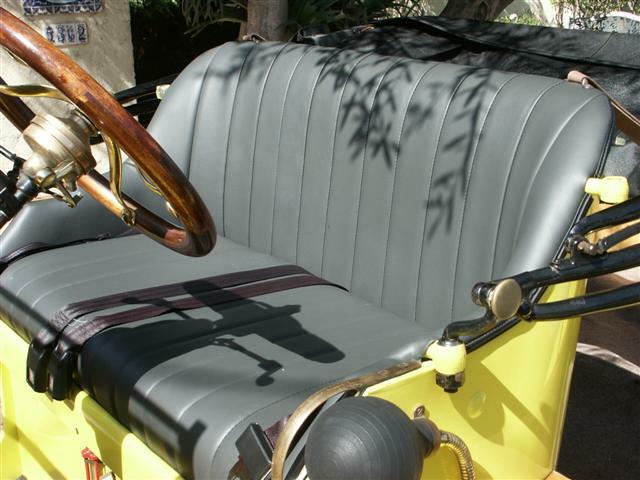 I take my daughter all the time in the Model T. The car had seatbelts installed in the rear seat prior to my ownership and she always is strapped in with her carseat - I'll post a picture later in the day. It still won't be as safe as a modern car, yet I try to make it as safe as I can for all of the family, while still retaining the look and feel of the era. To take the modern metal would not do my daughter any favors. What appreciation would she gain for antique automobiles? Because we take the car to family outings and club events, I hope my daughter comes away with the same enjoyment and fond memories that I did as a child. I loved the HCC tours and riding in my dad's Michigan. It was one of the highlights of my youth. Whe I was a kid, child seats in cars didn't exist�at least not as safety equipment�and those that did were not attempting any pretense of protection because nobody had yet come up with the idea of crash tests. 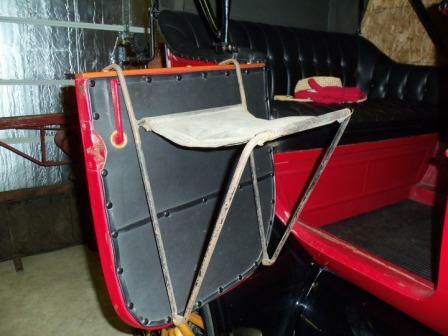 Rather, such metal frameworks were clipped to the backrest of the front seat and the toddler inserted therein so as to keep the kid more or less stationary. 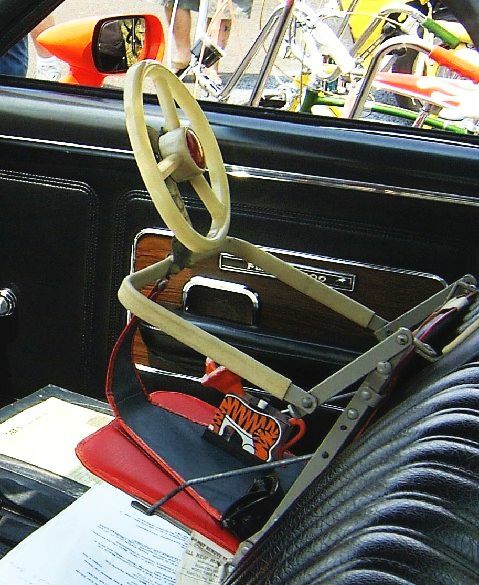 For purposes of maintaining such static positioning, a distraction in the form of a cute little plastic steering wheel was attached and the child actually believed such minuscule gadgetry would impart directional control to the family behemoth. There was a little horn in the middle and beeping away at it was more fun than repeatedly whining, "Are we there yet?" 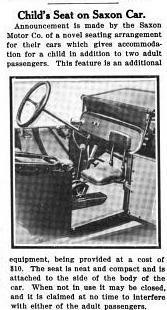 Older children could lay down on the rear deck, pressed up against the back window, or sit on Dad's lap, sharing the driving duties, four hands on the 24-inch, finger-knurled wheel. Will, I did much the same thing. Some folks today would be shocked that we survived our childhoods. I remember standing between my 17 year old brother's legs and steering the '36 Chrysler Imperial Airflow sedan when I was no more than four. He said we once went 100 that way. BTW, he joined the Navy not long after, and was one of the decorated heroes of the Franklin after it was hit 100 miles off Japan in March, 1945. He was interviewed for a DVD just released: "USS Franklin, Honor Restored." The Ashland cop couldn't catch my two brothers with his '36 Ford, so convinced my Dad to sell the Airflow. 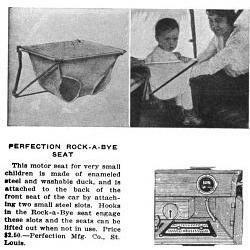 I posted this because somewhere I remember seeing a touring with a basket for a baby that was held out over the back. Has anyone seen that? Ya 5 kids, 2 adults all in a cab over or fighting to see who got to sit on the motor facing the front and one facing the rear in a Ford van with the other three on floor,later we did get a rear seat. Or 2 moms and 8 kids in a ranch wagon! Ah the good old days! Anyone up to use one of these? That certainly was a cool looking car. One of my favorite shows, too. Here is a version I would like to build someday. Sounds like a lot of us have a story about unsafe cars. Hard to imagine in today's environment. As about a 4 year old, my mother was taking me to a Dr. appointment in the family 1940 Chevrolet sedan. I was in the back seat (suicide doors). Evidently I had my hand on the door handle, because when she stepped on the brakes at an intersection I braced myself on the door handle and next thing I knew I was standing in the middle of traffic watching my mother drive away. She quickly realized that the door was open and looked around to see if I was OK. She later said she was in a state of shock when she stopped and waited for me to get back in the car. We continued on to the Dr. appointment. He was an asthma doctor, but said my cuts and bruised should heal fine. Moral of the story: I've been a Ford man all my life.